The story of “Galpin’s Glide”, the illustration on the front cover of the book “Feat of Arms” about Operation Ladbroke. The picture is “Galpin’s Glide”, a specially commissioned illustration by aviation artist Anthony Cowland. 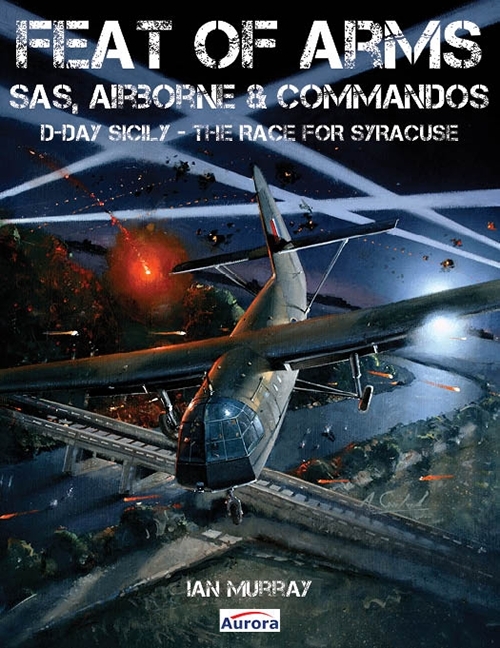 It is an artist’s impression showing Glider 133, a Horsa piloted by Staff Sergeant Dennis Galpin, carrying a platoon of the 2 South Staffords coup-de-main force, coming in to land in the centre of LZ 3, next to the Ponte Grande bridge near Syracuse in Sicily. Galpin’s glider is caught in the glare of a searchlight mounted on the roof of Maniace Castle on the far side of Syracuse’s large harbour. The searchlight has followed him down and has helpfully lit up the Ponte Grande bridge, which guides him to his landing zone. The bay was ringed with numerous light and medium anti-aircraft guns and searchlights, and these have caught another Horsa in their beams. Galpin has just passed over the Ponte Grande bridge where it crosses the Mammaiabica Canal. The bridge’s defenders have fired a flare, and machine guns in strongpoints across the river and in a tower to the south are targeting Glider 133. It is seconds away from touching down. The glider was later found to have over 30 holes in it caused by anti-aircraft fire.